The Front Climbing Club is a 10,000 square foot world class climbing facility fitted beautifully into a circa 1915 historic building in downtown Ogden, Utah. Rustin Ostler served as the main designer and project manager for this exciting project while designing for Method Studio. 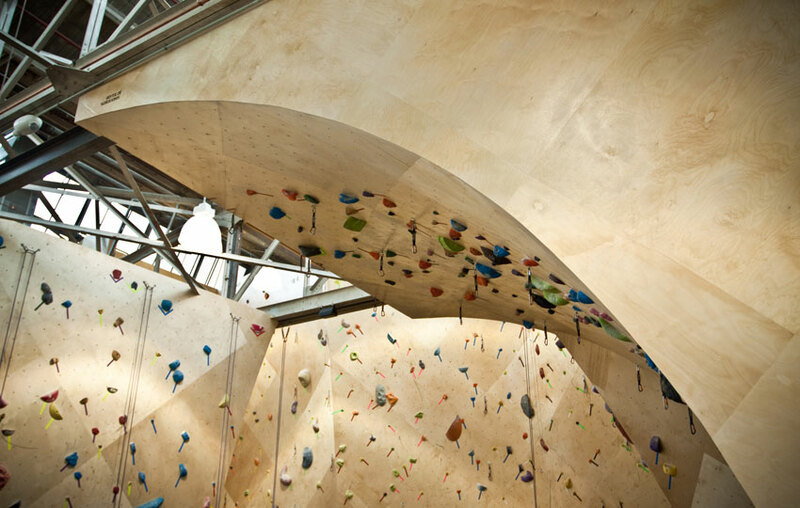 Part of a historic redevelopment project, the climbing and fitness facility utilizes the original glass and steel structure to support and illuminate undulating climbing walls. Thanks to deliberate design strategies, climbers enjoy bouldering, lead, and top-rope climbing walls bathed in natural light from the extensive glass walls, thus blending the external view with the internal experience. Private yoga and Pilates studios located on the new mezzanine also benefit from the calming natural light that falls through a continual skylight on the roof. The interplay between exterior and interior space continues as night falls and citygoers passing on the street connect visually with the illuminated sculptural climbing walls seen through the glazing. Taking advantage of all that natural light is not merely an esthetic or experiential design strategy, but is also part of the gym’s participation in the 100% Green Program. Green features of the facility include limited electrical lighting during daylight hours, low and no-flush fixtures to minimize water consumption and use of reclaimed lumber in various applications in the project.